Around 90 kilometers from the Chandrapur district headquarters is Bhari, a tribal Gram Panchayat (GP). Sitting on the border between Telangana and Maharashtra, Bhari is in the Jiwati block of Maharashtra. A nice cement concrete road with beautiful cotton fields on both sides, constructed under Pradhan Mantri Gram Sadak Yojna, leads to the village. At the village’s entrance, you can see a health sub-center full of scheduled tribe patients from the nearby hamlets, kids enjoying free meals at the two adjacent anganwadi (mother and children’s health) centers, a bunch of teenagers playing football on a big playground in the residential school, and a Gram Panchayat office with a computer and printer. Roaming through the lanes of Bhari gives you an impression of a developed village, with all essential public facilities like a bus stop, hand pumps, ration shop, commercial shops and solar street lights. Most of the households in the village have pucca houses connected to a sewage system. Getting access to electricity or clean water is not part of these households’ daily worries. Yet this is only part of the picture. Bhari may look well developed, but many of its households struggle to get electricity, clean water, education, healthcare and stable housing. How can this be? Bhari is not just a normal village or Gram Panchayat. It’s a Group-Gram Panchayat. What is a Group-Gram Panchayat (GGP)? In Maharashtra, a village with a population over 500 gets its own Gram Panchayat, but small villages with population under 500 are clustered together under a single Group-Gram Panchayat. The government treats all the villages and hamlets in a GGP as a single village for planning and revenue purposes. Classified as a single entity, Bhari is actually 1 central village and 10 widespread tribal hamlets. Though most people in the central village Bhari are OBC (Other Backward Classes), most people in the Group-Gram Panchayat Bhari are from scheduled tribes. While Bhari’s villages are the picture of rural development, its tribal hamlets — which aren’t even shown on a map — remain far from development. Kantabai* is a 59-year-old widow who lives with her two sons and a daughter-in-law in one of the tribal hamlets. She cooks on a chulha, and her family eats before it gets dark because they don’t have electricity. She walks 2 kilometers to fetch water from a nearby river, which often dries up during summer. Her family lives in a kutcha house with no toilet. The hamlet where she lives has barely 4 or 5 houses, nearly 4 kilometers from the central village. She has to walk to the central village to buy groceries. During monsoons, she goes to a nearby river with her family to catch fish and frogs for dinner. Tribal hamlets like the one Kantabai lives in are still struggling to get basic facilities like electricity, clean water and education. Forget about cement concrete roads — the road to these hamlets is just a print of bullock cart wheels through fields. No vehicles except cycles can be used on these roads. Some of the hamlets are so far and inaccessible from the main village that even the GGP members haven’t yet visited them. The tribal communities’ lifestyle is still far different from the lifestyle in central Bhari. Why are Bhari’s tribal communities falling behind? Stable housing is a problem for Bhari’s tribal communities. If one or more family members in a Bhari tribal community die within a year, the community leaves their hamlet, calling it jinxed. Every two to three years, a full hamlet of three to four households abandons their newly built houses (from government schemes like Pradhan Mantri Gramin Awaas Yojana), moves to a new location, and builds temporary houses. The government doesn’t provide new houses every time a community moves, so tribal communities often end up in unstable housing, unable to avail the government’s housing schemes. Getting access to schooling and healthcare is also a problem for the tribal communities. On first glance, it shouldn’t be a problem — each hamlet has its own school and anganwadi center. However, the people who run these schools and anganwadis usually stay in Bhari’s central village, not in the hamlets they serve. To reach the hamlets, they have to walk three or four kilometers. They usually only make this trek once a week, which means that hamlet schools and anganwadis are rarely open. This lack of education can compound the hamlets’ problems. Without a proper education, it’s hard for these communities to know their rights. Scheduled tribes in Bhari often don’t know that it’s their children have a right to get nutritious food from the anganwadi center every day. They often don’t know that their schools should be open daily. If they don’t know their rights, how can they know when the government is not following these rights? Since Bhari is majority scheduled tribe, it is eligible for the PESA Act. The Panchayats (Extension to Scheduled Areas) Act sets up a system of self-governance for majority scheduled tribe areas, giving local tribal communities control over local resources and additional TSP (Tribal Sub-Plan) funding. In theory, scheduled tribe communities can use these resources to develop the hamlets. So why isn’t this happening? Why are resources focused on Bhari’s central village? One reason that development is concentrated in the central village is that Bhari’s Gram Panchayat members live in the central village. This means they’re more aware of problems in the central village, and they have a personal interest in focusing on those problems. To avoid this bias, the PESA Act mandates that the Sarpanch (head of the GP) must be from a scheduled tribe. Janaki, the Sarpanch of Bhari, has to walk 4 km through fields and streams to reach the GP, so she usually only visits once a week. On other days, she is busy working in the fields and taking care of her family. Because she’s not as available as the other GP members, she just doesn’t have as much ability to take full advantage of her position and drive change in Bhari’s hamlets. But development isn’t just in the hands of the GP. PESA GPs are required to have a quarterly Gram Sahba, where scheduled tribes come together to plan and budget for the GP’s development efforts. However, this planning happens on paper, so everyone who wants to be involved has to be in the central village. Many scheduled tribe members don’t attend since they don’t want to lose their daily wages and spend time walking 4 km to the GP. If scheduled tribes aren’t involved in the planning process, it’s hard for them to get funding allocated to their communities and issues. Bhari is a great example of why microplanning is so valuable and important for equitable development. Most government policies — both at the national and state level — are issued from the top down, like the policies for scheduled tribe communities. These policies are built with the best intentions, but they often just can’t keep up with the ground reality. For example, Pradhan Mantri Gramin Awaas Yojana couldn’t account for the fact that Kantabai’s community left their houses after two or three deaths in the community. The PESA Act couldn’t account for the fact that Kantabai often can’t attend quarterly Gram Sabhas and raise her voice in the planning process. Millions are spent today on these broad policies that often don’t adapt to ground conditions. This is especially true for scheduled tribe schemes, which can be very general. The result is unequal development and budgeting in places like Bhari. The better option is microplanning, which bypasses the one-size-fits-all plan and uses granular local data to allocate the right funding and programs to the right places. This helps ensure that policies are localized to the communities’ needs. Bhari’s district collector, Ashutosh Salil, explained the value of microplanning this way: “Earlier if I had to budget Rs. 100 for 10 sub-districts, I would distribute [the money] equally. That can’t be the correct allocation if a block has been covered before and does not need more resources.” Bhari’s central village and 10 tribal hamlets don’t each need an equal share of Bhari’s resources. The hamlets need more targeted development plans, shaped by the needs, traditions, and voices of Kantabai and her community. 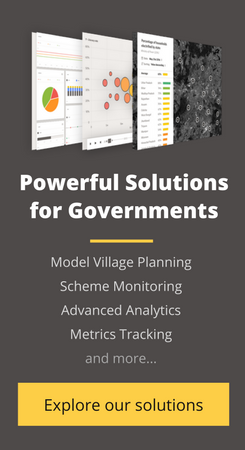 Learn more about how we carried out microplanning in the Chandrapur district of Maharashtra (which includes Bhari) to help the district government distribute its budget more efficiently and target its programs more effectively. Great research and write-up! Will look up the other post on microplanning. Keep it up social cops!